"A proposed anti-gay law could make Uganda perhaps the most dangerous place for homosexuals and drive the gays of Uganda further underground. 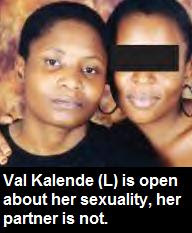 In a rare interview, the first of its kind with a newspaper journalist, openly lesbian, Val Kalende, told Saturday Monitor’s Rodney Muhumuza why she is very scared." The Sunday before last, Val Kalende listened quietly as her pastor’s sermon digressed into a soft tirade against homosexuals. “We may even have one in our midst,” the cleric told a congregation of about 50 born-again Christians.